Creed II is a sequel to the hit drama Creed from 2015 that was directed by Ryan Coogler (Black Panther, 2018). This sequel again pairs famous boxing champion Rocky Balboa (Sylvester Stallone, Escape Plan, 2013) with his protégé Adonis Johnson, the son of one of Rocky’s greatest rivals, Apollo Creed. This film picks up where the previous Creed film left off with Adonis (a contained and determined Michael B. Jordan, Fruitvale Station, 2013) continuing his reign as a boxing champion with Rocky Balboa as his humble mentor…until the son of another character from the Rocky films (with a heavy Russian accent) challenges Adonis to match his ferocious strength in the boxing ring. This sequel does not function as a great movie so much as a resource of nostalgia for the 5 original Rocky films from the 1970s, 80s, and 90s. 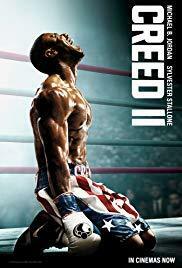 Creed II has the same dilemmas, the same journeys of redemption and perseverance, and even the same music (in select moments) as the original 5 Rocky films. I’m not against a film with a heavy dose of nostalgia, but there’s not enough contemporary, new, youthful, compelling freshness to help Creed II rise above its predecessors (or even rise up to meet its predecessors) in this enduring Hollywood franchise.